Monday through Friday, from 9am to 4pm daily. 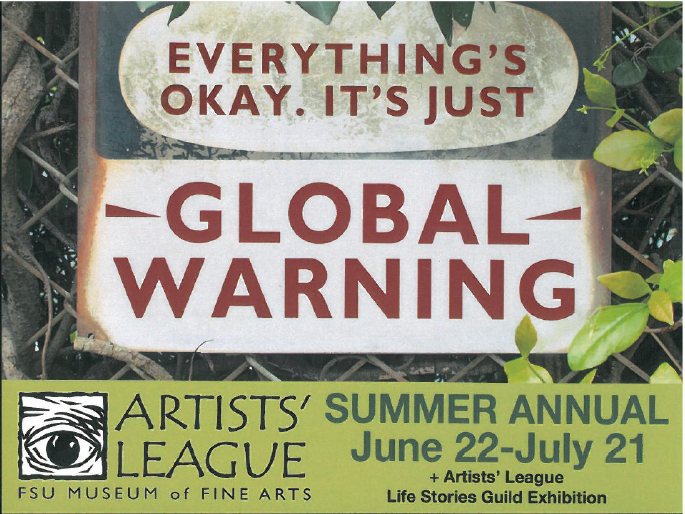 The Museum of Fine Arts Artists’ League Annual Summer Salon was juried by Brinda Pamulpati, Owner / Director of the Venvi Gallery on Park Avenue in Tallahassee. Monetary awards for this show total $2500. These awards include 1st, 2nd, Honorable Mention, Emerging Artist, and the David A. Knopf Emerging Artist Award. Non-monetary awards also given include Juror’s Mentions in six different categories: painting, drawing, sculpture, photography, printmaking/digital, and fine crafts. In addition, two Professional Development Awards will be announced at the reception. League members can apply for this award for funds for workshops, materials, etc. This year a Laurie Jones Award of Excellence will also be given. The League wants to thank patrons Linda and David A. Knopf for their generous contributions to the Artists’ League.